Mothers can now drop off unwanted babies both anonymously and safely with the Safe Haven Baby Box the first baby drop-off box in the U.S. reports the Associated Press. The Safe Haven Baby Box development comes amidst plans to defund Planned Parenthood, an organization that provides women&apos;s health services such as contraception and terminating a pregnancy, and comments from GOP presidential candidate Donald Trump who said women should be punished for abortions. The two Safe Haven Baby Boxes installed in Indiana were opened to the public beginning on Tuesday. 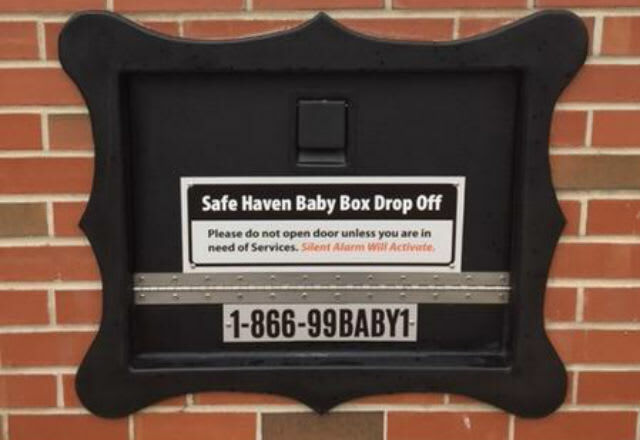 The Safe Haven Baby Boxes website lists one of the box locations as outside of the Woodburn Volunteer Fire Department while the other is located in Michigan City. Monica Kelsey, who the Associated Press reports is a fire department volunteer, founded Safe Haven Baby Boxes, the website writes noting that Kelsey herself was abandoned as an infant. The Associated Press reports the baby box at Woodburn was installed April 19, the anniversary of when Kelsey was abandoned by her mother at the hospital a few hours after being born. Kelsey didn’t immediately respond to Complex&apos;s request for comment. Safe Haven Baby Boxes work with the nationwide Safe Haven law which allows women to abandon unwanted newborns without any legal consequences at places such as hospitals, police stations, and fire stations. According to the Safe Haven Baby Boxes website the boxes have heating and cooling in addition to a security system to alert when a baby has been dropped off. The Safe Haven Baby Boxes website says: "These boxes have a heating and cooling unit and are equipped with ADT trips so emergency personal [sic] will be notified within 30 seconds that there is a newborn placed in the box. The child will then be picked up by EMS within 3-5 minutes." The Associated Press reports each baby box costs $1,500 to $2,000 according to Kelsey. The first 100 boxes will be paid for by the Knights of Columbus of Indiana (a Catholic-based church). "This is not criminal," Kelsey told the Associated Press. "This is legal. We don&apos;t want to push women away."